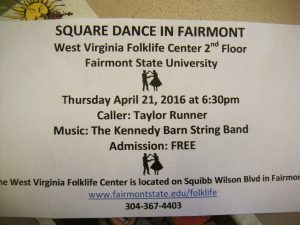 Taylor Runner is a square dance caller from Morgantown, West Virginia. One of his mentors was Worley Gardner who regularly called dances at the Marilla Center and was featured in Robert Dalsemer’s book “West Virginia Square Dances” published in 1982. Worley was known as a “singing caller” and Taylor learned his style of calling. Taylor has continued the tradition of calling for the Marilla dances as well as many other dances throughout the state and region including the WV State Folk Festival at Glenville, WV. Taylor is recognized for his ability to make dances fun and easy for everyone including first-time dancers. No one is made to feel discouraged or uncomfortable and it’s almost impossible to see a dancer without a smile on his or her face as they move around the room. Taylor’s passion and respect for old-time dance is evident in his enthusiasm, and he easily spreads that enthusiasm to others. Next → Next post: Free Callers’ Workshop Before May 14th Dance with Gaye Fifer!